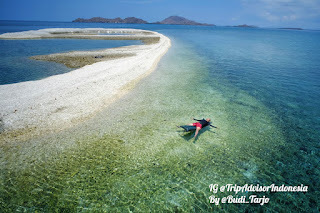 Trip Advisor Indonesia - Danau Pulau Sembilan (Sembilan Island Lake), Labuan Bajo: is one of the rare salty lake in Indonesia. It is created from the ancient nature process which trapping the sea water into the island consisting of a circular coral reef surrounding a lagoon. There are two main lagoons in this area, the small and the big ones. The big atoll can not be entered without special permits. And the most common visit is the small lagoon. 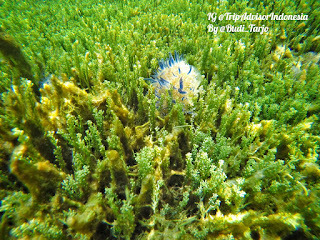 The small lagoon of Pulau Sembilan is a host of the thousands rare blue tentacle Jellyfish. 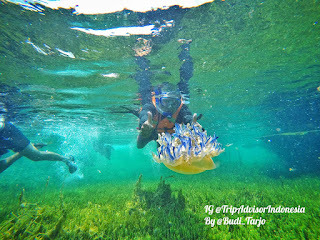 Though it is not dangers, touching the Jellyfish is not allowed. There traditions and local culture protects the area by specific rule before entering the area. There are as follow: spit off does not allowed during visit and life vest jacket must be wore during the snorkeling session and visitor forbid to stand against the corals. Thus, urinate also forbid and visitor must take bath at the outer sea water before entering the location. The Sembilan island itself taken from the local words which mean the form of the island is similar with nine character. 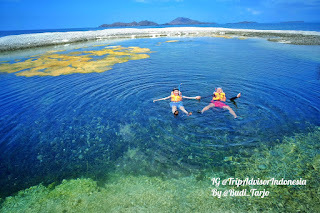 It is located at the north west of Labuan Bajo and belonging the Komodo of the dragon archipelago. This area is protected by UNESCO as the world heritage sites. Note: Please see contact bellow.